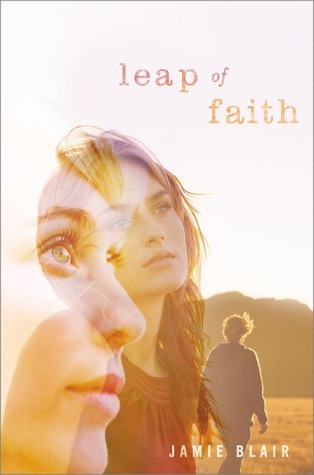 WoW: Leap of Faith by Jamie Blair ~ Love.Life.Read. A weekly feature hosted by Breaking the Spine, come play along by posting titles that you are looking forward to reading when they are released. Her real name is Faith, not Leah. She’s seventeen, not nineteen. And the baby isn’t hers—Faith kidnapped her.Faith’s history catches up with her when a cop starts asking questions and Chris’s aunt spots her picture in the newspaper. She knows it’s time to run again, but if Faith leaves, she’ll lose Chris. If Chris is in love with a lie, though, did Faith ever really have him in the first place? I am always on the lookout for another young adult author, especially a contemporary fiction author at that. I think this one sounds intriguing--some mystery mixed in with the romance. What title are you looking forward to reading this week? Thanks Brandi! I hope so too but I have so many titles to read right now. :) That's a good thing though! Thanks for stopping by and Happy Reading! This one was on my WoW a few weeks ago. I really like the sound of it. Nice pick! Thanks for stopping by and following Shane. :) I think it sounds so intriguing. Happy Reading! I hadn't heard of this one. It sounds really good! :) I hope it will be. Thanks for coming by today Tia. Happy Reading! What a great choice! I've been reading more contemps as of late, and this sounds so emotional and refreshing...definitely adding it to my TBR. :) Contemps are my favorite so I am always looking for some more to add to my TBR pile. Thanks for stopping by and following! Happy Reading! This does look interesting. I will have to add it to my list. Sadly it totally looks like a book that I would read a chapter of and then skip all the way to the back to find out what happens. Of course then I would read the whole thing. Thanks for visiting my WoW. Haha. I know what you mean. :) I have done that to a few books too. Thanks for popping over to my spot. Happy Reading! There are so many unknowns and questions, that I think it will be a really intriguing read! Thanks for stopping by Samantha. Happy Reading! I have never heard of this one before! It sounds super good and is going straight to my TBR! :) Great pick! It has my attention too--I am looking forward to reading it. Thanks for stopping by Katharyn. Happy Reading! It is interesting to blog hop to see all the books today. Definitely some that would be something I would pick up and others probably not. That definitely is one of the appealing parts of the WoWs. :) Thanks for stopping by and Happy Reading! Thanks for visiting and commenting on my WOW! So glad you liked it enough to add it to your TBR!! As for this novel, it sure does sound interesting, as well as heartbreaking. I usually prefer to read paranormal romance, but occasionally I do read contemporaries. I got goosebumps reading the synopsis. This sounds really good! Like you I'm always looking for new contemporary authors to read, and this one doesn't sound like it's your run of the mill boy meets girl. Excited for this one! Thanks for sharing, and popping by my blog earlier Stephaine. I did to--it does not seem the usual run of the mill book. :) Thanks for coming by my blog and following Elle! Happy Reading.